We hope you enjoy our site and our dogs. We live just outside of Concord, New Hampshire. 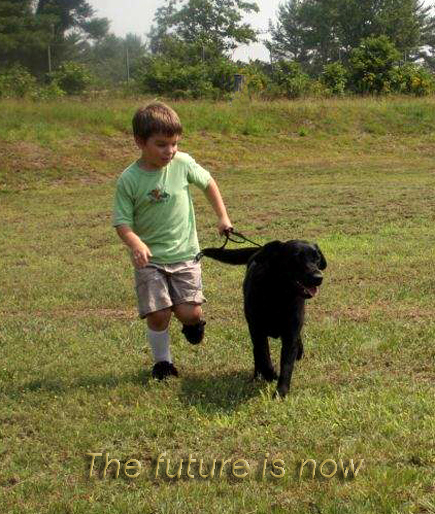 We have owned Labs since 1983. The first Aragorn Labrador litter was produced in 1994. We are hobby breeders and have a litter every year or two. Our dogs are family members. Historically, obedience training has been our primary formal AKC activity although over the last few years, we have been in transition. Our breeding program is now more focused on our goal of successfully competing in the breed ring. Some things haven’t changed, however. When choosing stud dogs, we still tend to choose conformation champions with hunting backgrounds. Our physical preference is for moderate size and substance. Health and temperament are always our highest priorities. All puppies are considered pets first and foremost, but hopefully – given their well-rounded genetic backgrounds – many will become hunters, obedience competitors or shown in the breed ring. All breeding dogs are OFA and ACVO evaluated. Please contact us at 603-456-3008 or via email.